Enom is no longer able to provide .au domain registrations to any reseller that is based in China. This follows a formal direction Tucows was given by auDA, the registry for the Australian top-level domain, .au. In a letter we received today, auDA is directing Tucows, under the terms of our accreditation agreement with auDA, not to deal with any reseller based in China in relation to .au domain names. auDA cited an increased number of complaints they have received in recent months regarding domains that were fraudulently registered using unauthorized Australian business information. Those registrations, as auDA determined, appear to have originated from resellers based in China. Enom is required to comply with auDA’s direction and will disallow all resellers who are based in China from any domain registration involving a .au domain name, regardless if those registrations would be fraudulent or not. We understand that auDA’s measure may disrupt legitimate business of resellers, solely based on their location, and apologize for any inconvenience this may cause to our resellers in this market. Why are ccTLDs so complicated? This industry is complicated. Recently, we shed some light on how the domain channel operates, and the unique roles that ICANN, registrars, registries, resellers, and registrants play within this interconnected system. In the world of generic top-level domains, like .COM and .ORG, the channel structure is at least clearly defined, although registration policies and requirements vary among the different domain extensions. With country code top-level domains (ccTLDs) however, things get a bit more complicated. What’s unique about the ccTLD channel? A not-for profit organization, such as in Armenia (.AM), Belgium (.BE), or New Zealand (.NZ). While gTLDs all operate within a standard channel structure (ICANN → Registry → Registrar → Reseller → Registrant) ccTLDs work a little differently. Some ccTLDs follow a Registry-Registrar model, which functions much like the gTLD model. The Registry only offers registrations and domain management through accredited Registrars. Sometimes these ccTLDs are open for anyone to register and sometimes they are restricted to local nationals. Still, many of these Registries offer the Registrar a formal registration portal and API so that domain management can be automated. Some ccTLDs do not accredit Registrars at all and instead work directly with Registrants. Registrars can still manage these domains, but must often log into an individual account and make changes to these domains manually. 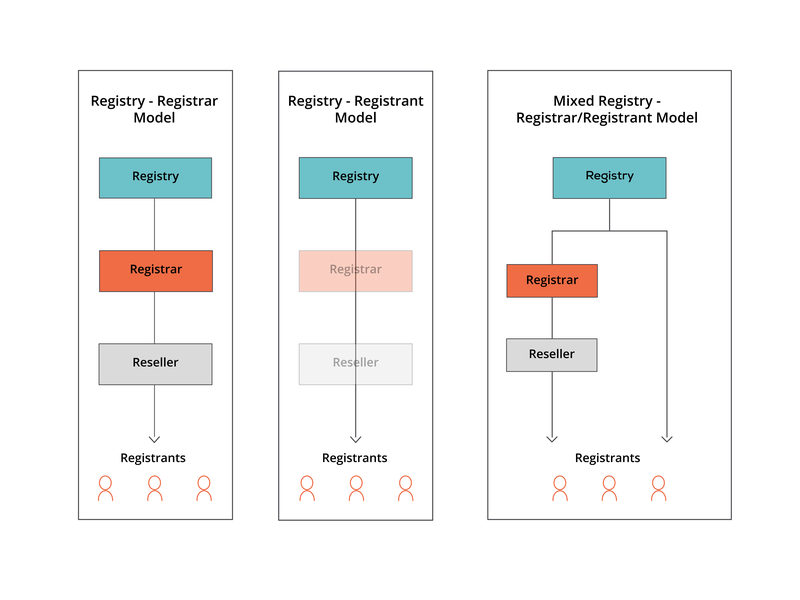 Registries with this model usually require the Registrant to be a local national or to supply documentation before they can register or manage their domain. Though it’s rare, some ccTLD Registries work both with Registrars and directly with Registrants. Registrants pay much higher prices than Registrars do to manage their domains directly with the Registry. This model often leads to confusion for Registrants since management and registration processes may be different for Registrars than for Registrants. When any registry makes a significant policy or procedural change, there are often important consequences for us and our customers. However, the ccTLD system is particularly vulnerable to change. Since governments are often involved in the decision-making process, changes to requirements, processes, and pricing can happen overnight. What’s more, many organizations that operate ccTLD Registries have very little knowledge of the domain industry, receive little funding, or operate the Registry as a public service. This means that processes can be complicated, prices high, and information scarce. Hopefully, this leaves you with a better understanding of why ccTLD registration and management can be more cumbersome than that of gTLDs. While changes at the registry level may be out of our control, we’ll always adapt to them using a strategy that minimizes the impact on you and your business. Our goal is to make it easy for you to take advantage of our extensive ccTLD and gTLD selection.